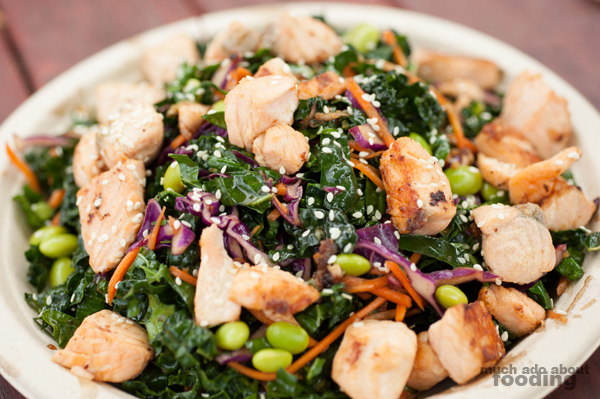 Do you have a favorite go-to spot for lunch, for healthy meals, and for tasty food? Why can't it all be the same place? That seems to be our relationship with the talent over at Green Tomato Grill (GTG) whom we've written about before and whom we visit whenever we are up in that area (good thing my car dealership is near there so I can get food during oil changes!). It's a health-driven fast casual spot with a menu built out by talented Executive Chef Kyle Markt, previously of several culinary positions including in Laguna Beach hospitality. 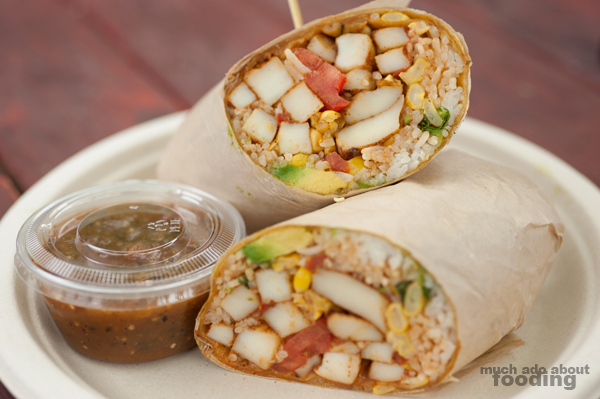 The items are geared towards balance with great taste, something we noted in a previous 2013 "Best Of Orange County" post. They have just passed their one year anniversary and from the point of us visiting to now, every stop in looks busier and busier. We were happy when we met up again with Chef Kyle to find out that Green Tomato Grill has outgrown itself and is looking to expand. The lucky communities (Anaheim Hills, Yorba Linda, and Brea) where the plan is to branch out to will soon get to taste the amazing, healthful food that we had seen on the previous menu as well as some of the summer items we also got to taste as well! So what's new since our last write-up on GTG? Aside from the specials, the menu has gone through a branding revamp. It's sleeker and with more photographs of what the dishes look like. There are additions to the housemade from-scratch sauces such as their corn salsa made of crushed corn and an agave lime salsa vinaigrette. There is a sesame vinaigrette (soy sauce, fresh lime juice, sesame oil, Sriracha, and sambal) that is used often with the Asian-inspired items as well as a Greek ranch brought on by the constant demands of customers to have a ranch sauce (despite its inherent unhealthiness). This is made from adding salt and Greek yogurt to the existing chili verde. Once the new locations start cropping up, Chef Kyle also has in mind that he will bottle his newest Habanero Hot Sauce made in a Caribbean style; it seems like everyone is obsessed with the heat-heavy pepper out here in California! After you get past the sauces which you can always get samples of before ordering anything, you run into his lemonade concoctions. There are always several going at the same time but for the summer, he was trying out a "Kyle's Hard Lemonade" concept by spiking the agave lemonades with shots of soju. We just had to see what these were about so went ahead and tried out the Cucumber Ginger Mint Lemonade, Pineapple Berry Lemonade, and Jalapeno Mango Lemonade, all spiked. The cucumber ginger mint is the most popular of them all with the customers, and I'd say the favorite between us two as well. They are refreshing and obviously made straight from the source of the ingredients. 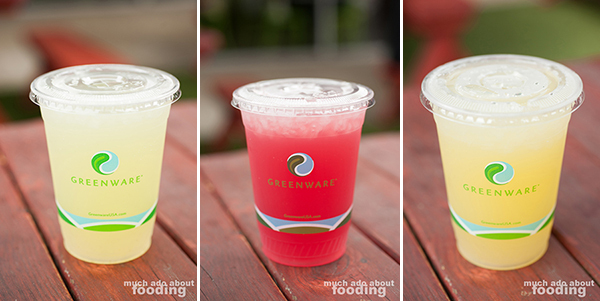 Kyle divulged his little formula with us of these drinks which are started in five-gallon buckets with their base. The addition of fresh parts afterward make up the taste whether it be a load of pineapple and berries or wholly blended jalapenos. Future stores (the next is 300 sq. ft. larger) are expected to carry more of these and other lemonades/juices but we are most excited about the recipe Chef Kyle has been sitting on - Horchata Iced Coffee, a riff on Vietnamese iced coffee using horchata instead of condensed milk. How heavenly does that sound? Now that you're busier, how has that affected your food service? "We're always packed now, and sometimes regulars will leave if it's too busy. Our goal for the food is still 10 minutes maximum during a rush to get food out but when we're slower, we want to get it out faster! So far, we've been able to do that. I don't even have to be here anymore; most of my cooks make things better than I do so I trust them more to do it than myself. I keep busy with management, social media, R&D, and building new recipes." Not only do they both have an extensive regular menu and a customizable build-it-yourself section, there is also a Specials menu that includes all of the summer items we got to taste this day. We started off with the Asian Kale and Salmon Salad ($10.95 - pan seared salmon served over dinosaur kale, cabbage, carrots and edamame in a sesame citrus vinaigrette), the first item ever on the GTG menu to break the $10 price point because of how generous the amount of salmon is. I absolutely loved this salad because it had so many elements that played well together from the moist and savory salmon pieces to the crunchy, hearty kale to the umami but tangy vinaigrette. It not only is good for you but tastes great as well. Every component complemented another, making for a balanced salad that could also easily be saved for later because the vegetables and kale did not wilt. We've talked about sourcing before. What are the challenges for restaurants? "There are not a lot of real concrete rules. People say, 'organic where possible, local where possible, natural' but that's almost a cop-out. As chefs, we want to know where our ingredients come from but our vendors don't always know; they're dealing in the commodities market. I'll ask where exactly my beef came from but they can just tell me that it came from a packinghouse that usually gets meat from these farms but there are no promises there. As the chef, I am the actual consumer of their product so if I don't demand ethical practices of that person, they're never going to figure it out. If the chefs aren't the ones looking to make the change but we're the ones buying from big AG, nothing can change." As a health-conscious restaurant, GTG does have a commitment to quality they try to adhere to. Our next item to taste was the Insalata Caprese Melt ($8.95 - heirloom tomatoes, fresh mozzarella, basil, and arugula drizzled with balsamic reduction and extra virgin olive oil in a grilled flatbread), the summer menu item with the shortest menu life due to Chef Kyle's own strict standards for tomatoes. As he points out, he's picky about them and they won't be good in season much longer! This one was bright and fresh as a different interpretation of the typical salad - it is not often that someone puts a salad into panini form. 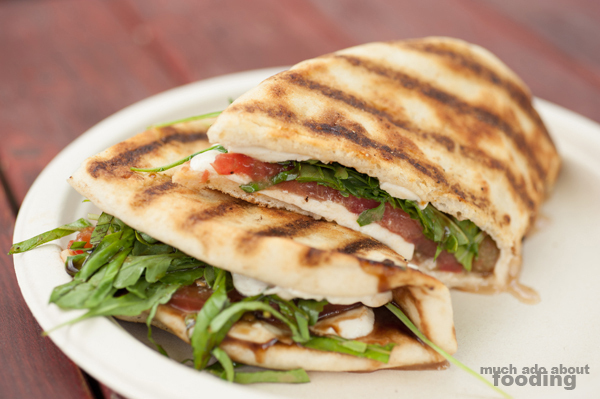 We liked the flavors on this but the balsamic reduction and olive oil mixed with fresh mozzarella ended up making a soggy sandwich once we were done; however, we learned that most people do take the sauce on the side to drizzle on each bite so that's our suggestion if you want to give this one a try yourself! 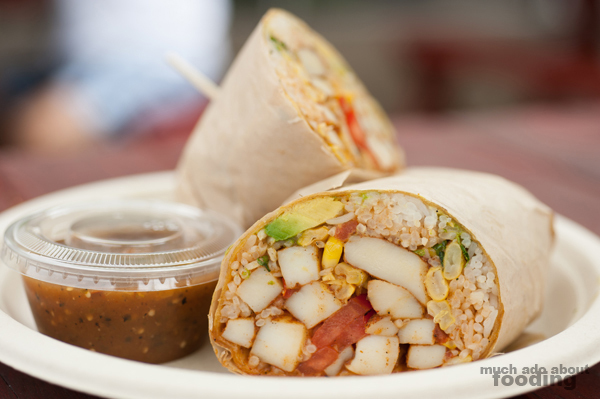 Duc's favorite of everything was the third major entree - the Blackened Calamari Burrito ($8.95 - grilled blackened calamari, avocado, sweet corn salsa, Roma tomatoes and cilantro lime rice in a chipotle tortilla with choice of chili verde or habanero fire sauce). The inspiration from this came from Chef Kyle's like of calamari steaks at Teppan restaurants and the GTG's common ingredients. Though the calamari was blackened, it had a bit of sweetness to it which worked very well with the corn salsa. Parcooked in really high heat and sauteed in blackening spices, the calamari is kept in tender strips, not rubbery. I enjoyed how the lime rice gave some dimension to what could have been a bland grain addition (the white rice). It was such a hefty dish that I can see it being saved for a second meal. "it's really not fair what I do to the cooks because we change a lot of things here. I'm always experimenting. I've even tried to make our fried items gluten-free but it isn't the same without panko which is ten times the cost if you buy it gluten-free. My one rule is you don't make the change unless it's for the better." 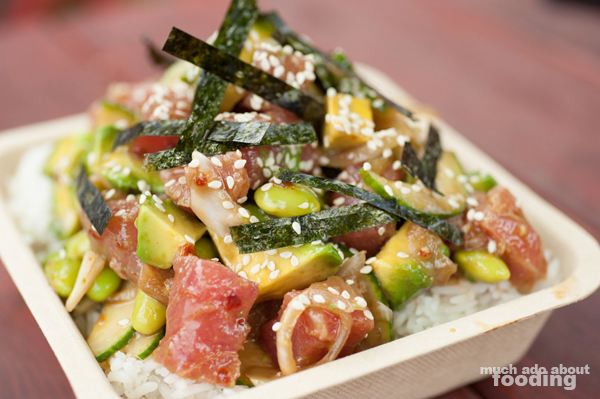 Our last summer menu item has also been the best-selling new entree for six months straight - the Hawaiian Ahi Tuna Poke Bowl ($9.95 - ahi tuna, avocado, cucumber, edamame, sweet Maui onion, sesame seeds, and seaweed in a sesame lime vinaigrette over white rice). It's a step in the direction that Chef Kyle wants to play with more once the restaurant expands; as the cooler weather starts to hit, there will be more Asian-inspired and miso-based dishes such as miso glazed salmon, miso soup, dishes with soy paper, and even an Asian slaw. This particular poke bowl was heaping with tuna when it arrived, glistening with the tangy and sesame oil-y vinaigrette that has made it a favorite among regulars. All of the ingredients are tossed fresh to order with the vinaigrette and lime juice to keep them from cooking by the citric acid. We both really enjoyed how bright the flavors were, how clean cut all of the components were, and the overall taste all together. Do you have to sacrifice a lot of ingredients? "Like butter? We're only frying in 100% canola oil but not heavily. In our tomoato soup, if you blend oil really fast, it'll give a bisquey element to it with fattiness on the tongue. When you're working backwards, the biggest success of this restaurant is the sauce we made up which we use to saute everything on the grill. It's a mix of soy sauce, lemon juice, Dijon mustard, garlic, shallots, rice vinegar, and oil - our everything sauce. It makes umami when it gets on the grill - gives a salty, buttery flavor." Though they cut out some of the fat in their cooking, GTG doesn't cut out the flavor and especially not with the desserts. They have several dessert vendors who make a range of items that are sometimes vegan and gluten-free (they label everything). If you like small cakes in shotglasses, find them when they have Tipsy Cakes in Chocolate Gnutella and Strawberry Lemoncello Shortcake flavors (gluten-free, soy-free, and dairy-free). If you are a parfait lover, a permanent item is their Vegan Peanut Butter and Jelly Parfaits made of silken tofu, peanut butter, agave, and jams that make up the vegan dessert. 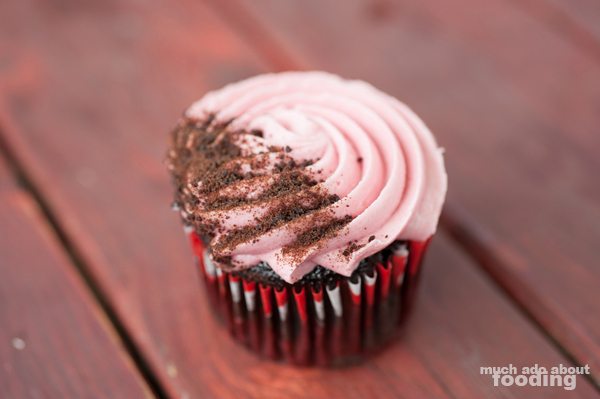 We were lucky enough to try a cupcake from Royal Tea and Treatery which is gluten-free and dairy-free which was moist, not too sweet, and a favorite among the whole staff (Kyle tells us they buy half the cupcakes when they come in so GTG is never fully stocked). We're happy that more communities will get to experience GTG as it grows. Congratulations to the whole crew! If you want to read more about their start, we've got our post here from last year. If those summer items were enticing you, they'll be around until the end of September so get your grub on today!